Soviet citizens of various ages often engaged in letter-writing campaigns. Whether they were supporting various political prisoners, protesting against Israel, or just wishing for the world peace, the dwellers of communal apartments and tireless builders of communism spent their time writing group or individual letters to anyone with a mailing address. When I was growing up® the sincerity of these letters was questionable and they became one of the many semi-mandatory activities in schools and pioneer organizations. Lack of sincerity wasn’t an obstacle when such important things where at stake. 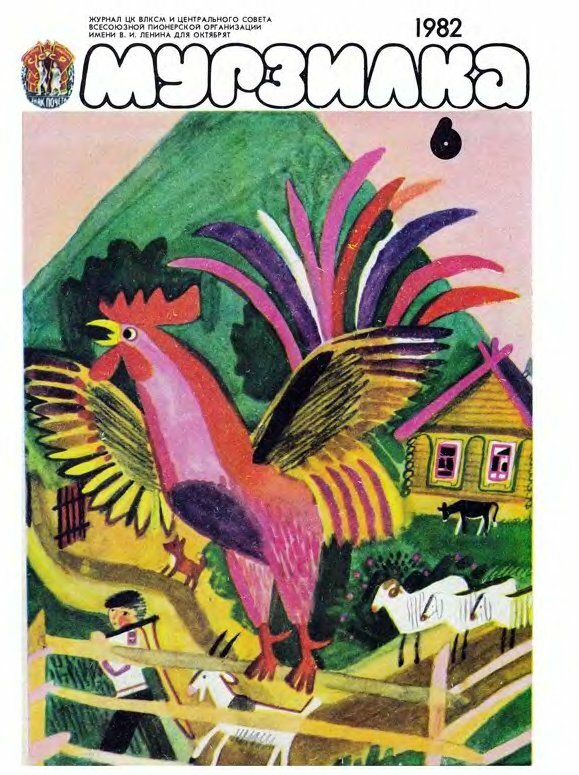 Below you will see a few pages from a kid’s magazine “Murzilka” which was very popular and widely subscribed by the Soviet children. 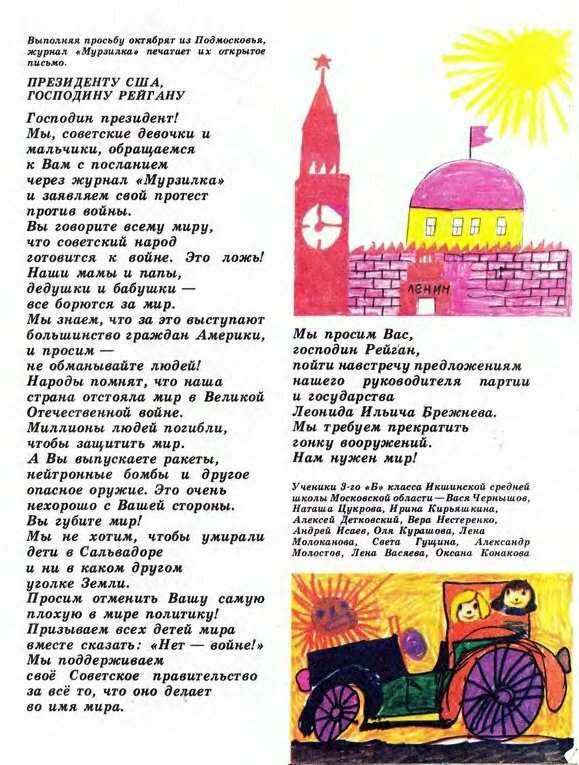 Murzilka has been asked by the children of the Moscow Region to publish this open letter. To The President Of The United States Mr.Reagan. 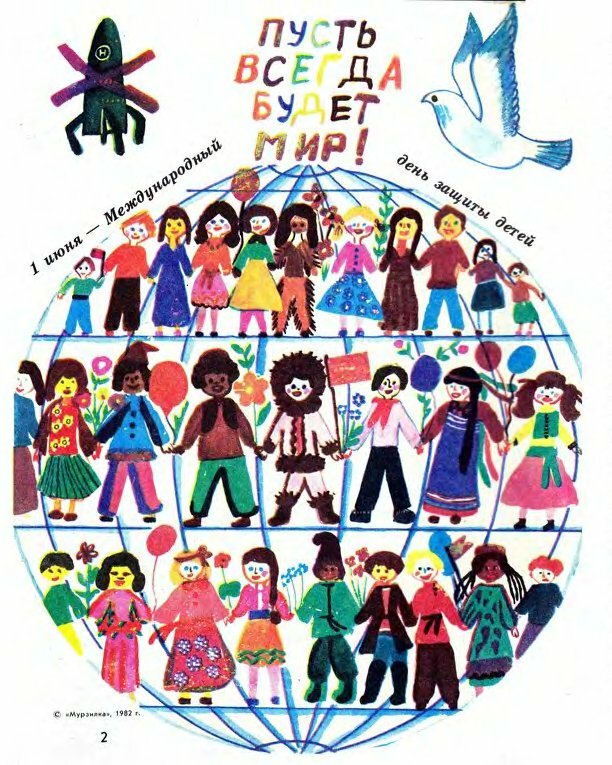 We, the Soviet girls and boys are sending this message of protest against the war through the magazine “Murzilka“. You are telling the whole world that the Soviet people are preparing for war. That’s a lie! Our mothers and fathers, grandmothers and grandfathers – everyone is fighting for peace. We know that the majority of the American citizens also want peace, and we ask – don’t deceive the people! Peoples of the world remember that our country defended peace in the Great Patriotic War (WWII), millions of people died for peace. But you are manufacturing rockets, neutron bombs and other dangerous weapons. This is not very nice on your part. You are destroying the peace! We don’t want kids to die in El Salvador or any other corner of the Earth. We are asking you to stop your policy because it’s the worst policy in the world. We are calling on all the children in the world to say “No to War!” together with us. We support the Soviet government and everything it does for peace. We ask you, Mr.Reagan to accept the proposals made by the leader of the Communist Party and our State Leonid Illyich Brezhnev. We demand the end to the arms race. Signed by the 3rd grade students of the middle school in Moscow Region. I am pretty sure Mr.Reagan went to his grave without reading one issue of Murzilka.